The I-O 5430e Print Server is a single port, multi-protocol print server. It provides full-function IBM Power8, Power7, iSeries AS/400 i5 or zSeries S/390 zSeries printing over an Ethernet network, as well as printing from Windows, Unix and other IP platforms.. The I-O 5430e attaches one parallel printer directly to your Ethernet LAN, and supports multiple protocols including TCP/IP, IPX/SPX, and NetBIOS. This support allows the I-O 5430e to be used with a variety of operating systems including Windows, Novell, Unix, OS/400, and OS/390. The I-O 5430e also supports one IBM printer session featuring I-O's field-proven IBM printer emulations. Combined, these unique characteristics enable users to share printer resources even when several different operating systems are in use. If you are looking for a print server with these capabilities that can support up to 3 printers, click here for the I-O Corporation 5450e. In addition to operating as an Ethernet LAN print server, the I-O 5430e supports AS/400 - iSeries and IBM Mainframe printing over TCP/IP, SNA (APPC), and AnyNet (SNA encapsulated in TCP/IP). 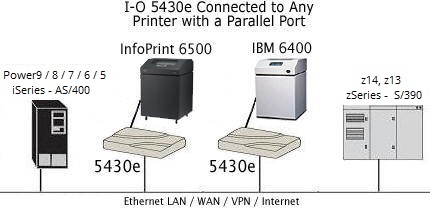 Using any one of these protocols, the I-O 5430e allows the LAN attached printer to offer the same reliable, full-function IBM host printing support as a direct system-attached 5250/3270 printer. These protocols also offer users one step set-up (auto-configuration) as well. The I-O 5430e can also speed up IBM Host printing. Since the IBM EBCDIC to ASCII data conversion is done by the I-O 5430e it frees the host, or a client PC from performing this resource-intensive task. This means a faster first page out, and overall increased speed. If you have a requirement for IPDS Laser Printing over your TCP/IP network from your iSeries AS/400 or zSeries Mainframe, click here for information on the 5735e IPDS Ethernet Print Server Gaterway. The 5430e offers the same reliable, full-function IBM host printing and control found with traditional direct attached Twinax/Coax printers. With the 5430e Print Server your printer is configured as a true "Device" printer and not a "Remote Out Queue Printer". Your IBM host print jobs are not lost in the black hole of "Remote Out Queue" LAN printing. The 5430e provides bi-directional communication between the printer and the IBM host, allowing error reporting and page range printing. Allows AS/400 print jobs to be seamlessly printed over a LAN. Prevents loss of AS/400 print data by providing same level of print status reporting as a 5250 Twinax printer. Eliminates unnecessary AS/400 or PC overhead by converting EBCDIC data directly on the I-O 5450 MPS. Supports up to three individual 5250 printer sessions for maximum printing flexibility. Permits full-function AS/400 printing on the attached LAN printer. Maximizes printer utilization by supporting concurrent printing not only from the AS/400 but from Novell, Windows NT, Windows 95, OS/2, UNIX, etc. Protects print server investment when upgrading the LAN to 100 Mbps. Allows attachment of up to three printers to the AS/400 and LAN using only one network connection. Installs in minutes by avoiding complex PC software configurations. Takes advantage of the LAN printers maximum print speed even when processing AS/400 jobs.